Our first French article is here! Have you seen this interview or this blog post yet? 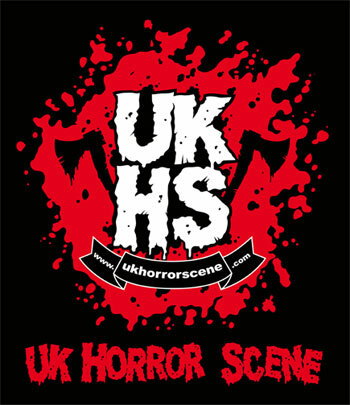 Interview with MTC creator, Zion, on UKHorrorScene.com website. Read it here. 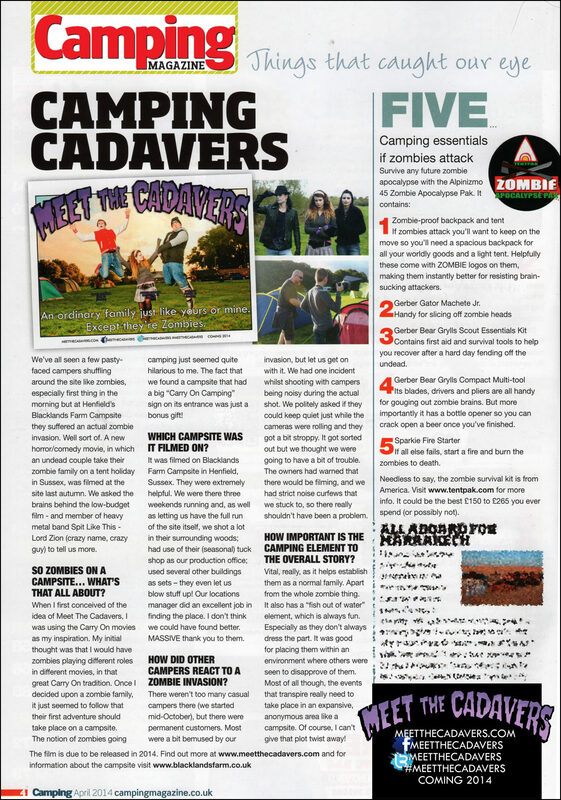 Feature in the UK's largest Camping Magazine (issue April 2014); includes an interview with MTC creator, Zion. Click image to read. 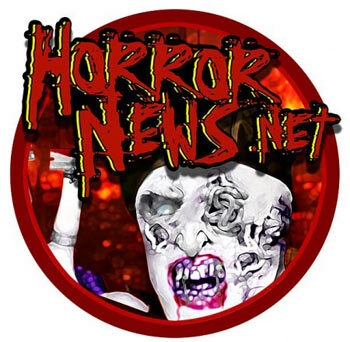 Interview with MTC creator, Zion, on the massive HorrorNews.net website. Read it here. 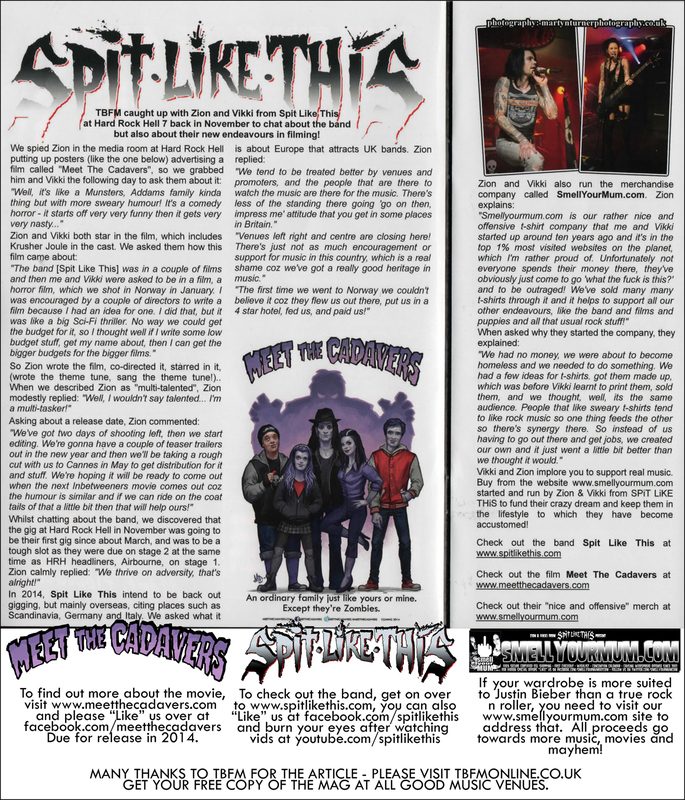 Interview/article from TBFM magazine, taken from an interview Vikki and I did at the Hard Rock Hell festival back in December. Click on the image to enlarge and read! Q: What inspired you to do a film about a family of zombies and is there any kind of hidden backstory that you place in as your own? 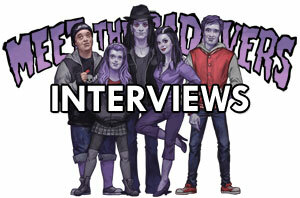 A: I like to do things differently and I liked the idea about a regular family who just happen to be Zombies. 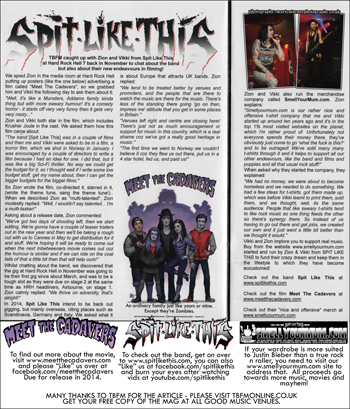 It is right in line with stuff like The Munsters or Addams Family, but for a whole new generation with modern sensibilites. As for hidden backstory, I didn't realise until it was finished that the prejudice the family faces for being different was the same kind of prejudice that I have faced over the years for looking the way I do. Most people into punk/goth/metal know that feeling! People judge others without really knowing them and there is a lot of that in this movie. Q: What type of budget will you be running on and how will you make sure budget dosen't affect the movie in a negative light? A: Budget is an ugly word. Who knows how much money we could waste if the budget allowed. As it doesn't, we have to be careful and we have to make sure that every penny is spent on what you will see on the screen. A lot of low budget pictures suffer through things like wardrobe and props. Those are things we are concentrating to remove the amateur look cheap films tend to have. Sure, there are things we cannot do that we would love to do but, until you get to multi-million dollar blockbuster territory, it is just part of the process. It certainly isn't something I dwell on. Q: When filming and directing how do you get yourself into the "zone"? A: Apparently, I don't! I couldn't answer this until Saturday just gone but I just get out there, instruct and get on with it. Thankfully, I have a great teacher in director David who is letting me really get stuck in. Years of running a band obviously helps as I am used to being one of the people in charge. Q: No matter how the movie goes do you think you will be doing any more movies in the future and do you have any ideas lined up? A: Definitely! We hope this is a success so we can make more. I have ideas for the sequels and even for spin-offs. Beyond the Cadavers, there are plenty of other movies in my head. One written, two being written. Q: Out of your many roles (fitnes guru, director, web shop, music artist, writer etc) what one is your favorurite? A: I really enjoy the writing process. Creating people and then dictating their lives appeals to me immensely. I can literally make them do whatever I want, and I like that. I also really enjoy the directing. I definitely see my future in films, but will also keep my hands dirty with everything else I get up to. Q: Meet the Cadavers is a comedy Zombie movie with the principle characters being the zombies themselves. Is the audience going to see a Zombie comedy in the vein (excuse the pun) of say, Wasting Away; a more sparkly affair like the recent Warm Bodies, or will they be treated to something else? A: Something entirely new and unique. I excel at that. Take an idea and twist it on it's head. Q: The film has been written by you. What influences have you drawn on and why the “Zombie” family as opposed to say an “Alien” one or perhaps something more extreme? A: Zombies are fun! And, as I had a unique take on the genre, it seemed fairly obvious to me to go down this route. It takes big balls to muck about with well established lore and I am sure I will come into criticism, but that is OK. I can handle it! Q: You have brought David V.G Davies in to Direct and edit the film. What other films or TV work has he been involved with and why did you chose him to help steer your film? A: Me and Vikki worked with David on a film he was directing in Norway, "Blaze Of Gory". We were in very extreme conditions yet had so much fun. I knew I got along with him so it was just whether he wanted to be involved or not. Thankfully, he did! Q: Looking at the published cast list this seems to be very much a family affair with members of Spit Like This and others (such as well known DJ Krusher Joule joining the cast). Will this continue for future productions given that the film centres around a “family”, or will audiences see more cameo roles from bigger stars should the budget permit? A: I like to keep my friends close. How much more fun is it to do stuff like this with people that you like and get along with? I will always be trying to work with people that I know, first and foremost. Q: Presumably the budget for this film is tiny in comparison to a Hollywood blockbuster, not necessarily a bad thing given the success of “District 9”, but how much does this affect what you want to do with the film. A: It just means we have to think smarter, that's all. A lot of money is wasted on big budget productions; that is the main luxury we won't be able to afford. Q: With an independently funded production like this one you have pretty much complete control, but it does have its drawbacks. How much influence would you be willing to give a backer if they were to provide a much larger budget for a follow-up project. A: None whatsoever. In my experience, people that provide such services aren't creative people. If they were, they wouldn't be coming to me. The only reason they are coming to me is because they think they can make money from me and, if that is the case, they will just have to go along with what I want to do or hop along. It's call independence for a reason! A: It occurred to me that no-one has come up with anything to rival The Munsters or Addams Family. It is such a great concept and fish-out-of-water stories always work well for comedy. So I wanted to create something that was brand new. Sure, it borrowed elements from those bygone concepts but it fully updated the comedy and introduced an element they never had - spine-chilling horror. Q: As a first time scriptwriter, was it difficult to know where to start and how to go about it? A: This is actually my second full screenplay and I have others on the go. However, it is a new way of writing for me. The hardest part is getting a hang on the actual format of the screenplay; working out what needs to go in (in terms of direction and action) and what is left out (prose, mainly). Most creative writing ventures inside the brain of the character but, in a screenplay, you can only write what is seen. You can't see thoughts, so you don't put them in. I got a handle on it pretty quick though and now it is almost second nature. My second script (MEET THE CADAVERS) is much more fluid than my first. I presume it is a skill I will continue to get better at. Q: Has it been a bit of a whirlwind from you starting to write to now getting the movie made? A: I guess so, but I wouldn't have it any other way. Why sit around and wait to do stuff? Just get it done. Life is short and I try really, really hard not to waste a day. Any day I don't do things to reach my goals is a day wasted. Now it is habitual and I am always striving forward. If I had had this work ethic when I was young, I would have take over the world by now! Q: When will Meet The Cadavers be released? A: 2014. The plan is to take it to Cannes in May and other film festivals then get it released during the summer. Q: Some fans look to you and Vikki as inspirations - you're successful business people, rock stars, and now movie writers, stars & producers! Is there anything creative that you can't do? A: Yes, so I avoid them. If you are a naturally creative person, you tend to be flexible and you tend to find that many skills cross many different potential pathways. Why stick to one when there are so many more to explore? These days, you can try on many hats as people don't pigeon hole you as much. I have built up a loyal army of friends / fans / followers - whatever you want to call them - and they seem to trust my instincts. I only put my hand to things I think I could do very well indeed. Q: What advice can you offer to fans who feel inspired by what you're achieving, yet may not know where to start to do their own thing? A: Don't fear rejection. Don't fear failure. Don't fear the word No. Follow the Yes's in life and see where they lead you. Take risks. Be prepared. Seek opportunity and leap on it when you find it. Most of all, just get on with it - stop thinking about it and just take the leap! Got a question you would like to ask any of the cast or crew? Email it to us and we will try our best to answer it here!